One of the most important methodological advances in the archaeology of the past quarter century is the use of Geographic Information System (GIS) in archaeological research. Within this time frame, GIS has evolved from an emergent geospatial technology with limited mapmaking capabilities to a technology of choice for cultural resource managers, planners, and academic archaeologists alike. This dissertation examines the evolutionary trajectory and impact of GIS in the discipline since its introduction, and its potential to support new applications of GIS-driven innovation in archaeological research. As part of this project, two separate studies were conducted. The first study assessed adoption and diffusion trends for the technology based on the published literature from 1987-2010 using bibliometric and content analysis. These results suggest that despite adoption reaching a critical mass point in 2003-2006, GIS use is still maturing, and emphasis continues to be on methodological refinements rather than theoretical advances. Many of the technical developments coincide with larger changes within computing and in the convergence of technologies and platforms within the GIS industry. Recent publications, however, indicate the emergence of a possibly new direction for archaeological research which relies more on computationally intensive rather than empirical methods of investigation, in effect blurring traditional distinctions between method and theory. The second study conducted as part of this project explores the implications of this phenomenon by developing and implementing an application within a GIS environment for knowledge discovery in databases. The objective was to explore the feasibility and efficacy of geographic data mining using current technologies and archaeological data standards, identify barriers to its implementation, and demonstrate a new course for GIS-driven innovation in the field. 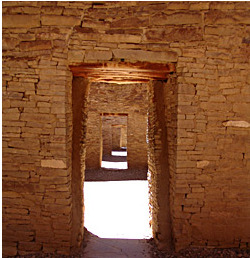 Various archaeological and environmental datasets from the Fort Wingate Depot Activity in western New Mexico, USA were selected, compiled, prepared, and analyzed as part of the case study. Logistic regression was combined with Weights-of-Evidence modeling to discover previously unknown but statistically significant relationships and patterns within the prehistoric and historic data. This study offers suggestions on both how to adapt old data to new technologies and how to adapt new technologies to new ways of thinking.